Yes, sat at such desks inkwell and all. But ours were bolted to the floor with the fold down seats others described. Only vaguely remember any ink in it. What we (I) used them for was to polish the closed brass cover with my pencil eraser until it actually gleamed. Now THAT was an accomplishment for a school day. This was early 1950's. I also remember reading the scratched in the wood (with the pocket knife every boy carried) initials, names, messages boys carved for posterity. Several nazi, 'kraut' and 'Jap' references as these desks were in use through the afteryears of WWII in the 1940's. Went to one school reunion a few years later. The stand out memory is that the same desks were there -- but the brass inkwells were GONE. All of them. No doubt they were ripped out by vandals and sold for their street metal value. 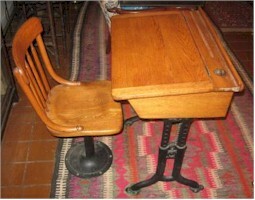 I'm so old that I remember those grammar school desks with the wrought-iron sides, an actual inkwell in its top, and the fold-down seat attached to it for the student in front of you. In fact, I have a VIVID memory of them. On the first day of a school year back in the 1940's, an overweight member of the class sat down in her seat, and the seat broke beneath her. The broken desk, on which the sharply-pointed metal framing for the wooden seat had broken away from its moorings. was retired to a spare room. A month ir so later, I was sent into this room to crash-learn the lead part of Christopher Columbus in a class play. The original 'actor' had taken sick and I was brought in as his understudy. While pacing the floor in that room, desperately trying to learn the script, my left knee rammed itself into one of those prongs and I still have the scar on my kneecap to prove it. Unfortunately, the next day, the day before the performance, after I had learned every line, the original Chris returned to school, his health restored, and he went on to star in the play. I had to return to my minor two-line speaking role as the Court Herald. Talk about disappointed! I've never gotten over that, even though it happened 66 years ago! 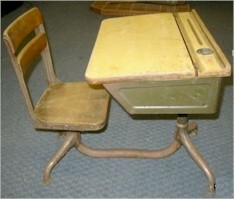 My elementary school had these desks and ours were even older than the ones pictured. We had decorative wrought iron on the sides, but since it was the early '70s, we all had ball point pens. Yep....and I remember using the little bottle of India-ink and a fountain pen. Messy stuff!